Suddenly, everywhere he looked he saw catastrophe, bloodshed, the demise of the planet, the ruin of the human race, not to mention (to pinpoint the exact source of some of his anxiety) possible pain and suffering to himself. Who could have thought up a scenario this bleak? Whoever (whatever) it was, he could feel the dark malevolence of it settling in, making itself at home like some vicious bird of prey, its shark claws sunk deep into the quivering grey jelly of his terrified brain. He pulled his brother close, tucking him in against his body, pressed his lips to the child’s face. He became enmired in what if. The weight of it wrapped itself around his ankles and dragged him under. David’s new obsession with the “what ifs” of life takes the form of the belief that fate is out to get it. To trick it, he decides to completely change his identity: he changes his name to Justin, gets a new look, and takes up activities he used to hate before, like sports. But it’ll take more than a new skin to make Justin feel at ease at again. It’ll take a few very problematic months, some new friends, a very wise one-year-old, and an imaginary dog named Boy. Ah, Meg Rosoff. And to think I believed I couldn’t possibly love you more. Somehow I was under the impression that Just in Case was everybody’s least favourite Meg Rosoff book (well, not quite everybody’s, as it did win the Carnegie Medal), so I expected not to enjoy it quite as much as her others. Furthermore, I wasn’t completely sold on the premise, as I imagined that my lack of belief in fate would affect my enjoyment of a book in which the concept seems to play such a prominent role. Which is missing the point quite spectacularly, I now see. Much to my surprise and delight, I fell head over hells in love with this book. 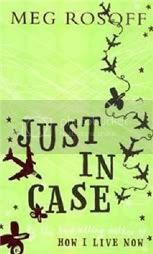 Just in Case is unusual, brilliant, peculiarly funny, and very moving too. What really made the book for me was the fact that the tone was absolutely perfect: on the one hand, it’s slightly humorous, which keeps it from ever becoming too dramatic. On the other hand, it’s full of nothing but respect for Justin’s vulnerability and for his penchant for teenage drama and overearnestness. Yes, his belief that fate is out to get him is slightly silly, but at the same time, it’s dead serious. We all realise these things for the first time at some point, don’t we? Nobody can escape the eventual realisation that life is unpredictable, that we’re incredibly vulnerable, and that bad things do in fact often happen to perfectly good people. Justin fails to take this newly-acquired knowledge in stride, but who can honestly call that silly? Living with this knowledge isn’t easy, even when you’re an adult. Just in Case is a story about fear and how not to let it paralyse us, about existential anguish, and about accepting the precariousness of our lives and learning to enjoy each moment anyway. We can’t live on “what ifs”. As Justin’s wise little brother says, just in case what? The worst that can happen probably is quite bad, but that’s only one possibility among several less terrifying ones. Justin’s existential crisis is what sets the story going, but Just in Case is actually about much more than just that. It’s also about relationships; about budding teenage sexuality; about growing up; about identity; about blind chance; about the ethics of art; about the space between people, and what ties us to one another, and how we’re all in this together. As usual, Meg Rosoff writes about all of this with perfect insight and perceptiveness. I couldn’t be more of a fangirl. For all its pain and tragedy, Just in Case is ultimately quite a positive book. But it never makes light of our very human fears, it never treats them flippantly, and it never ever assumes a pseudo-inspirational tone. Therein lies its brilliance. He was the only one with no mission, no plane to catch, no breakfast to serve, no children to entertain. All around milled anxious groups of travellers, all nationalities, all colours, all sizes and shapes and sexual persuasions. Sometimes they smiled at him, struck by his face, his coat, or even his dog, establishing the most fleeting of human connections, a millisecond of brotherhood. We’re all in this together, they said to him, silently, in a hundred different languages. Later that day Justin thought back on their conversation and wondered whether the things that kill you were not just the crashes and explosions from without, but the bombs buried deep inside, the bombs ticking quietly in your bowel or your liver or your heart, year after year, that you yourself had swallowed, or absorbed, or allowed to grow. The child nodded. A piano might fall on your head, he said, but it also might not. And in the meantime you never know. Something nice might happen. The premise sounds very interesting and original- I love stories where everything changes in a blink of an eye and to do that without getting too dramatic is really hard. I’m glad you enjoyed it, I’ll definitely be adding this one to my ‘to be read’ list. I have to admit I had never heard of this auther before, would you recommend this book of hers or another? It is hard to get my head around this book...it is light-hearted, but serious, poignant, with hope. Which I guess is your point. How brilliant to find all of these aspects in one book! I'm dead serious. One year, I'll just follow you around and read everything you do, like a puppy. It will be the Nymeth Challenge. Great review, sounds like a great book, thank you! My mother could be Justin Case! Ooh how she lives to remind us of the 'what if's' and the ' just in cases'. Personally I have become a more fly by the seat of my pants girl, because I can no longer live in that mindset. I actually have this book and I can't wait to read it now, though I am wondering whether I should lend it to my mother first! I must admit this was my least favorite of the three of hers I've read - but it's still very very good! I haven't completely read your review because I don't want it to influence my own, but I'll come back to think more deeply about it afterwards. I haven't read anything of hers, but this book sounds really well done. The idea of allowing fear to take over is a great one to write about. When my sister was about 15 or 16, the two of us went with my dad to watch Dead Man Walking in theatres. The death of the two teens in the woods affected my sister in a very similar way and she became extremely terrified of death. For at least a year, she was a walking basketcase, and she tried to work out her fear by throwing herself into everything she worked on. She started getting up an hour earlier in the morning to practice flute (which annoyed me - having someone play flute 10 feet from you at 5 in the morning is NOT PLEASANT). She started counting calories to make sure she could stay dancer-sized. Etc. Worst thing was that she was so tense and scared that she woke up every morning with a stress-induced form of lockjaw. For about fifteen minutes, she couldn't move her mouth, and she was so angry and terrified that she spent that time smacking herself in the face. So the premise of this book makes complete sense to me, having lived with something similar. I'm not sure I'll read the book - you remember what my last reaction to a Meg Rosoff book was - but it does sound interesting. Maybe I'll try it from the library. I've never read any of Rosoff's work and now I feel like I've really missed out! This one sounds so good - David/Justin sounds like such a great character. I'm adding her books to my wish list. I am not familiar with this author, but this book sounds "right up my alley" I definitely plan to check it out later this summer. Somehow, I missed this one. Rosoff has turned into on of my favorite authors. Thank you for a wonderful review. "Living with this knowledge isn’t easy, even when you’re an adult. "...Ain't that the truth!!! I swear since I became a parent, I fight that every day...the constant "what if" worrying. I fight it soooo hard because I know how destructive it is to both me, and potentially to the kiddos if I ever fail to keep it in check. I don't think I've ever read a review of this book before, and now I think I'm more eager to read this one than any of her others. And that's saying something! It almost sounds a little like Justin is dealing with an anxiety disorder. Did you get that feel from the book? That being said, this is a book that I think would work for both my daughter and myself. She is a big Rosoff fan, and I know she hasn't read this one yet. Also, my book club just picked Maise Dobbs as our read for this month. When my friend pulled it out of her bag, I squealed and said "I just read the most amazing review of this book!!' Needless to say, I am excited! I am going to be going back to your review when I am finished and seeing how close our thoughts are, but I will remember while reading that you had a few reservations about the story. Your poor sister, Amanda. Did things improve? This is what made the book a less of pure joy-ride for me than her others. It was a book that realistically addressed the onset of a mental problem without *addressing* it. I felt Rosoff chose to honor Justin's perspective by ignoring the elephant in the room; no one can ignore an elephant like a teenager or writer as skillful as Meg Rosoff when she puts her mind to it! The problem was I couldn't ignore it. Do you think one of the things she was saying was sort of, "Just because you are suffering from an anxiety disorder, doesn't mean the world isn't full of things to be scared of."? But I'm not sure if it made sense for Justin to find his way out of his little hell the way he did. There are times I worry about this sort of thing, too. I always get anxious when a family member goes on a flight, or takes a long car trip. I don't really VOCALIZE the fear, but it's definitely there. The premise of this book really appeals to me. I think too many of us focus on the what ifs and don't enjoy our lives as much as we might. I'd love to read a story where someone is trying to out game fate! Great review, as always! I've never read Meg Rosoff before, but now I want to. Which one of her books do you think I should read first? I keep seeing her books and one of these days I must pick one up! Thank you for such a great review Nymeth. I've never read anything by this author, but now I really want to! Just in Case sounds so original and so compelling... perfect. As a girl who dealt for years with anxiety and "existential anguish" as you put it, I am incredibly interested in this book! There are too few, especially in YA fiction, who dare write on the subject. I have never read Rosoff before, but I have on of her books here so I'm definitely willing to give her a try. Thanks for the amazing review! Trapunto - Yes, my sister got better after a couple years. She went to NYC for college and sort of went crazy for awhile, which I think was just another reaction. She's still scared of a lot of things - like she has to drug herself up to fly - but at the same time she has lived and worked in the Middle East for the last few years and so faces those sorts of fears head on (she flies back and forth from there to here at least once a year). Lua: I loved that quote too :) And the character who says that is just wonderful. Jessica: My favourite is What I was, so I'd recommend that, but it's hard to go wrong with her. Sandy: lol :D It does seem strange that a book would combine all those feelings, but she makes it work! Vivienne: I think she'd appreciate it, yes :P One of the things I loved about the book is that it offers no one-size-fits-all solution to make the worry go away (because really, who has one?) but sometimes merely identifying with a character can be such a comfort. Meghan: My least favourite is, bizarrely enough, The Bride's Farewell. I say bizarre because it's historical fiction set in the Victorian age and with strong feminist undertones :P And it WAS good, but not as good as her others :P I look forward to your review of this! Amanda: Your poor sister :( I was going to ask how she was these days, but I see you've answered Trapunto. I'm really glad she's doing better! About the book - one of the things I admire about Meg Rosoff is how absolutely versatile her voice is, so I don't think that you having hated How I Live Now will necessarily mean you'd dislike her other books. Kathy: I hope you'll enjoy them! Molly: She's absolutely fantastic - a Carnegie and Printz Medal winner/honour list, and with good reason. Gavin: She has become one of mine as well. I think you'll enjoy this! Debi: It's only human to feel that way, my dear. But then again, it's only human to fight it too. we do our best. Jill: I loved that response too - that's a wise one-year-old if I ever saw one :P But yes, at the same time I sympathise with Justin. And I love the fact that the book never made it sound like it was easy for Justin to just click the "off" button and make his worry go away. I don't think Meg Rosoff can do any wrong! At least with anything I've read so far. Thanks for linking to my review! I like that idea! Just in Case is probably in my top ten YA books of all time :) Especially love that last line...sigh. Loved your review! I'll be keeping an eye on y'all. I should really try to read more by Meg Rossoff. I've read How I Live Now and I remember liking it, but I can't seem to remember anything apart from that. I'm going to have to reread it at some point, or try some of her other books first. I never realised she'd written more than one. Great post - you got me interested in the book! I included this over at Kate's Library as part of my Friday Five! I've not read anything by this author ... you've convinced me to try this one though! SOLD! This does sound good, Ana, especially after having read your review. It sounds like the author found a good balance. Never read anything by this author, but you make the book sound so good. I can only imagine a 15 year old living in so much fear. Zibilee: Yes, I definitely did get that feel. His mental state is precarious at best. I hope both you and your daughter enjoy this, and I can't wait to hear your thoughts on Maisie Dobbs. Trapunto: "Do you think one of the things she was saying was sort of, "Just because you are suffering from an anxiety disorder, doesn't mean the world isn't full of things to be scared of?" Yes, I did - and that's one of the things I meant when I said that the book took his fears seriously. When I pause and think about it carefully, what's amazing to me is that more people *don't* feel as paralysed as Justin did, rather than the opposite. I see what you mean about the "way out" being sort of random, but that's part of what made it work so well for me. If it had been a more, I don't know, sensible process, I worry it might have made the book feel a bit prescriptive, sort of, "Look, he snapped out of it, why can't you to?". This way, Justin slips into his anxiety disorder chaotically and slips out of it just as chaotically, which defies the one-size-fits-all-solution interpretation that books about these things run the risk of having. So I don't think Rosoff ignored the mental problem necessarily; I think she just skilfully avoided giving an easy answer, because who has one? This way, it's hopeful (in a "maybe-the-fear-will-go-way-someday) without being simplistic/inspirational (as in, if-I-do-this-I'll-stop-feeling-anxious-too). Jeanne: I'm shocked and horrified that you hated What I was ;) (I'm kidding, I'm kidding! And I won't say sorry either :P). And yes, Justin is certainly crazy, but in a realistic way. Stu: It's both positive and painful, which is what makes it so good. Aarti: I do too - I think most of us do, really! Susi: What I Was is by far my favourite, so I'd recommend that! Iliana: You're most welcome! I hope you'll enjoy her books. Emidy: She's nothing if not original! Her books are all so different, and so unique too. Kay: Very true - you don't hear enough about it, but I don't think that this sort of anxiety is uncommon at all. Jodie: Yes you do! She's seriously brilliant. Stephanie: I know you weren't quite as crazy about What I Was as me, but I hope you'll enjoy this one! I agree that her writing is something else. Stone Cold Books: You're welcome! 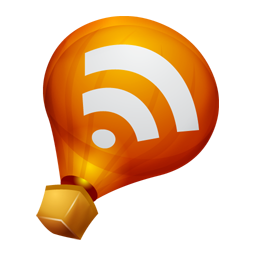 And feel free to use the interlinking idea :) It's something I find really useful, both as a blogger and as a reader. Iris: She has four novels out - 3 YA ones and one for adults. Kate: Thank you for including it! Wendy: She really did - it's neither bleak nor too easily positive, but it's very hopeful too. A hard thing to achieve! Violet: Adolescence seems like such a propitious period for this sort of anxiety. So many of us deal with these ideas for the very first time then. I adore Rosoff's writing, so easily sold! Great review thanks, and have a nice week off. I've not read anything by this author so can't really comment. But the story of this one sounds good. I'll keep it in mind, Ana. Thanks! I really enjoyed this book when I read it last year! Rosoff does a great job, in my opinion. Only one book by her so far that I didn't love.